Ramen Noodle is one of Japan's most popular dishes and commonly eaten Japanese food. Japan is a country filled with Ramen fans, Ramen connoisseurs, and certifiable Ramen maniacs. Ramen is so popular that there are a lot of Ramen shops in Japan and competition is very severe. Ramen shops are mainly competing each other with their uniqueness in noodle, soup, ingredients, and toppings. Ramen fans stroll around and find their favorite type of Ramen. There are basically three types of Ramen in Japan: Sapporo Ramen, Tokyo Ramen, and Kyushu Ramen. Each of them are different in their geographic origin. Sapporo Ramen is originated in northern part of Japan, Hokkaido. Sapporo Ramen which Ezogiku's Ramen belongs to, is famous for Miso (soy bean paste) Ramen. Ramen is filled with mound of bean sprout and pork stock soup. Tokyo Ramen is originated in Tokyo or eastern Japan. Ramen is famous for thin noodle with simple toppings. Soup mainly uses chicken stock and lightly tasted. Kyushu Ramen is originated in southern region of Japan called Kyushu. Kyushu Ramen is famous for Hakata Ramen and Nagasaki Champon. Uniqueness of Kyushu Ramen is its soup stock. It uses pork bones and boils them for couple days until final soup comes out white. Its taste is popular among oily and rich soup lovers. 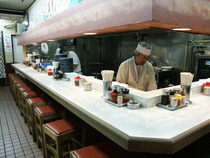 Most of Ramen shops in Japan including our stores operate with open kitchen style with counter only seats. With this style, Ramen cooks perform both cooking, serving customers, and cashiering all by themselves. These cooks are called Ramen Shokunin which means Ramen technicians. Their cooking movement is so rhythmical that customer can actually enjoy watching while waiting. Opening a Ramen shop is not difficult but success depends on serving quality Ramen pleasing to the customers tastes. Miso Ramen is our signature Ramen and also is what Ezogiku is well known for. Miso is the origin and sould of Ezogiku. We make the Miso paste for Miso Ramen with our secret recipe of more than 30 spices. We let it mature and ferment for 2 months. Since Ezogiku established in 1968, this secret spice and Miso paste are being produced only at our Honten (Main Branch at Waseda, Tokyo). The recipe is only known by late Ezogiku chief cook, Tomoji Onishi's successor and founder Kenichiro Mitsui. Opening Ezogiku plan was started when the founder Kenichiro Mitsui traveled to Sapporo, northern island of Japan, where he was impressed with the taste and popularity of Sapporo Miso Ramen. There is a place called Ramen Yokocho (Ramen Row) in the city of Sapporo where narrow street isle is filled with Ramen shops. He saw the potential to develop a Sapporo Ramen culture in Tokyo. Sapporo Ramen Ezogiku plan became reality when he met a Ramen Shokunin (Experienced Ramen chef), Tomoji Onishi. Kenichiro and Tomoji met in Sappporo when Tomoji was a apprentice of famous Sapporo Ramen specialty store . Tomoji and Kenichiro in no time shook hands to enter a partnership. Kenichiro was to take care of business matters and Tomoji was to focus on cooking and operation. They were both 26 years old. The first Ezogiku was opened in 1968 at Waseda University district of Tokyo. The store is so small that holds only 8 counter seats. With the limited kitchen area and customer seating, the first Ezogiku has just served only three Sapporo Ramen, Miso, Shoyu, and Shio Ramen. This store's become so popular that waiting line forms even after midnight. Following a couple years of successful operation in Japan, the first oversea operation, Ezogiku Inc. was established in Hawaii in 1974. We became the first Ramen specialized restaurant in Hawaii. Sixteen years later in 1990, Ezogiku Enterprises Inc. was established in Vancouver, British Columbia and again became the first Ramen specialized restaurant in Vancouver. Our Ramen has been loved by not only Japanese tourists and locals but also other local ethnic groups. Currently there are four Ezogiku in Japan, seven in Hawaii and two in Vancouver. Since the first shop opened in 1968, Ezogiku has been specializing in Ramen. 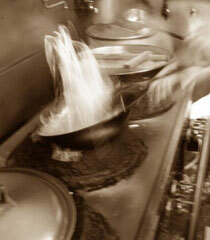 All of our restaurants are chain owned and adhere to original recipes which were developed in Tokyo. Our most original recipe, Miso (soy bean paste) Ramen is well known by many Japanese and introduced often on Japanese TV programs and magazines. To keep our originality and customer loyalty we import special Miso spice, a secret recipe which is made at the main branch in Tokyo, regularly from Japan. In this way our customers can enjoy same taste at any Ezogiku in the world. There are several types of Ramen in Japan depending on geographic origin, variety of noodles, and soup bases. Our specialty is Sapporo Ramen which originated in city of Sapporo, the capital city of the northern island of Japan. Ezo is the ancient name of this island; now known as Hokkaido. Giku (kiku) means chrysanthemum, the national flower of Japan. Together our name, EzoGiku was born. Our company policy and motto are to provide high quality Ramen with reasonable price at comfortable atmosphere. As a restaurant our number one priority is of course to provide high quality food and service. Our mission is to make RAMEN, Japan's national general public food, America's national general public food and go global. We have a spirit of being a Ramen pioneer and spread Ramen countries outside Japan.